Are my ideas worth sharing? A rhetorical question, but really. – Things and Stuff. I’ve been at a standstill lately. The task of creating something from nothing is daunting. There are so many reasons not to. So this morning I’m trying something different–I will not perfect my syntax as I type. I will just put my thoughts on the screen. Crap. I already failed my (anti-revise-as-I-go) resolution. So much for New Year’s–I can’t even stick to a goal for four sentences. But (…ok… ok…) I’m getting back up. I’ve been hesitant to touch the letters on the keyboard these past couple weeks, because does what I have to say really matter? It’s a question I’ve entertained and answered before (see this post), but like most doubts, it’s back. So I’m rehashing a truth that I think got lost in a lengthy old post. It wasn’t very viewed, but even if it were, I think it contains one of those truths that –at least for me–always needs replenishing. Yes, yes, and yes. I wonder all of those things. Except I haven’t fully embraced that I “have something *important* to say.” Do I have something to say? Yes. Is it important? I’m not sure–yet. Do I wonder if I “should take the time and energy to get all my *amazing* thoughts down on paper”? Basically yes, but… I’m giving some serious side-eye to that word, “amazing.” My thoughts are no more important than anyone else’s. I guess I’m humble in that way. It feels pompous to assume people would sacrifice their time to get in my head. Hmph. Jesus (almost literally) just whispered to my soul, “follow me,” waving me his way in warm invitation, a few steps further down the scary writing-path he has for me. But it’s not so scary when He’s there. That’s what He does. In the Hebrew Scriptures, long before the time of Christ, He manifested himself as a cloud by day and a fire in the dark of night, guiding Israel through unfamiliar, mostly frightening territory. Now He wants me to follow him down this writing path. I’m insecure about taking these steps of faith, probably because the unknown within is scarier than the unknown without. I’ve stepped with confidence onto the solid foundation of Christ’s word and love when he invited me to follow Him to Kazakhstan, Croatia, Slovakia, Mexico; to offer hope to lost, marginalized teenagers in His name through Young Life in the US and Kaz; and to I walk beside His solid footsteps through bizarre medical diagnoses (I’m fine, but probably should have freaked out a few times when I was contentedly ambivalent.). As with most times I journal, He’s met me where I’m at. My path into writing is so questionable because it is founded not on His words in the Bible, but on the still small voice His spirit whispers within me. When He was here on Earth, he had words worth saying–ones worth thousands of years (an eternity) of preservation and devotion. And He’s given words worth saying to seemingly endless sons and daughters. He’s given me some. And He will be with me as I find them and share them and question whether I should share them. Grateful that others have dared to believe their words are worth sharing. 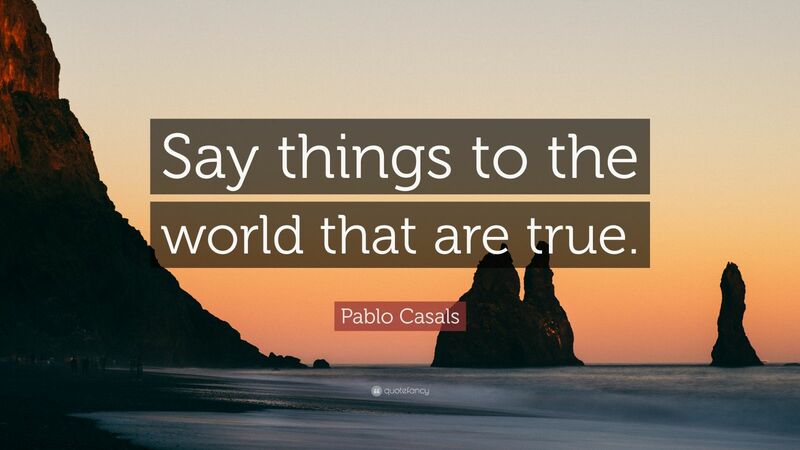 Like this musician, Pablo Casals, whose words are posted on the wall above my desk.